"Drop in when you're hungry" - Python takes 7/11 slogan literally! 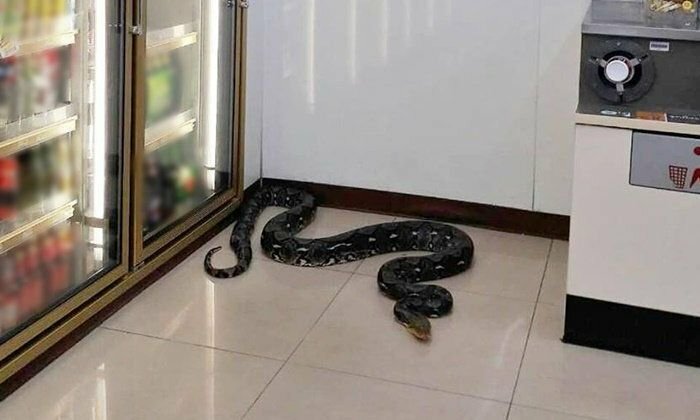 Thai netizens were sharing a story of a python being caught in a 7/11 store in their thousands yesterday. The slogan of the chain of stores that is very familiar these days is: "Hiw meurai ko we maa" - Drop in when you're hungry. And that is what the large snake did at the store by the Bo Yang intersection in Sri Racha, Chonburi. A video showed Sawang Pratheep rescue snake catchers - along with a 7/11 staffer - trapping the serpent and putting it in a sack ready for its return to nature. Other Thais were asking what is the number of the shop - for lottery purposes, reported Sanook. Appearances of snakes in unusual places are considered omens for a windfall. How can a snake that size come in the shop? Were the soidogs at the door in coma? They need a bigger bag! I guess they haven't heard about the "Mai sai Tung" (no bag, please) campaign!!! Soi dogs are smarter than that.. they may bark at strangers but when the intruder can eat you they know to stay quiet or find another temporary corner to reside! Why would a snake seek out air-con?